3. Why Don't Real-Estate Agents Use Better Photos? 2. What Makes Finnish Kids So Smart? Yet by one international measure, Finnish teenagers are among the smartest in the world. They earned some of the top scores by 15-year-old students who were tested in 57 countries. American teens finished among the world's C students even as U.S. educators piled on more homework, standards and rules. Finnish youth, like their U.S. counterparts, also waste hours online. They dye their hair, love sarcasm and listen to rap and heavy metal. But by ninth grade they're way ahead in math, science and reading -- on track to keeping Finns among the world's most productive workers. Do you think any of these Finnish methods would work in U.S. schools? What would you change -- if anything -- about the U.S. school system, and the responsibilities that teachers, parents and students are given? Share your thoughts. Despite the apparent simplicity of Finnish education, it would be tough to replicate in the U.S. With a largely homogeneous population, teachers have few students who don't speak Finnish. In the U.S., about 8% of students are learning English, according to the Education Department. 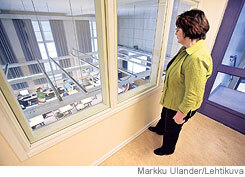 There are fewer disparities in education and income levels among Finns. Finland separates students for the last three years of high school based on grades; 53% go to high school and the rest enter vocational school. (All 15-year-old students took the PISA test.) Finland has a high-school dropout rate of about 4% -- or 10% at vocational schools -- compared with roughly 25% in the U.S., according to their respective education departments. Finnish students have little angstata -- or teen angst -- about getting into the best university, and no worries about paying for it. College is free. There is competition for college based on academic specialties -- medical school, for instance. But even the best universities don't have the elite status of a Harvard.